China-based photographer Ryan Pyle loves the still image and has continued to make his on film, even when trekking in remote areas. That hasn’t overshadowed his interest in multimedia though, which he’s been experimenting with recently. You can see the results below, where Ryan also shares his thought process in producing his first audio slideshow. Throughout the recent digital revolution in photography, I have continued to shoot film, but there is one area where I have happily adopted new lightweight digital capture — audio. With the technology jumping leaps and bounds, audio that previously required large, complex recorders can now be captured on small digital recorders, perfect for the kind of multimedia storytelling that I’m exploring. I’ve been intrigued with the advance of multimedia in the last few year, and especially how it can be used to enhance the art of storytelling. I have a deep respect for still photographers moving into video — like Tim Hetherington with his award-winning documentary Restrepo — but I’m not ready to turn in my viewfinder for a video camera yet. What feels right to me right now is the multimedia slideshow. You see, I love to write and I enjoy the process of preparing a script to accompany imagery. The multimedia slideshow allows me to go one step beyond the still image with regards to storytelling, but still aligns with my belief that still images are more powerful than moving ones. My first dabble in multimedia, I decided to create a slideshow (above) of my black-and-white fine-art project on Chinese Turkestan in an attempt to reach a wider audience. In my visits to the region several times a year for the last several years, I began recording audio with a small hand-held recorder. For the slideshow’s audio I used a “Call to Prayer,” essentially a man who stands on the top of the mosque and calls everyone to come and pray several times per day. It is something I hear all the time while working in the region and I thought it was fitting. 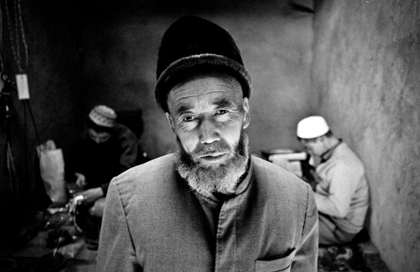 From Ryan Pyle's project on Chinese Turkestan. My goal here was never to produce a “news” piece or include various clips of audio with fuller storytelling. I wanted to create a space for the viewer to fully experience the still image. For that reason, the sequencing was incredibly important, and difficult. I payed particular attention to composition and flow, and I’m still working on it, since the project itself is not yet complete. One of the exciting things about this first foray into multimedia is starting to think about how this slideshow can support the still images in terms of publicity and marketing. For instance, I integrated the slideshow into my presentations at a few universities and galleries during a recent trip to the U.S. I was very pleased with both the impact of the slideshow and the feedback I received. Remembering that the end goal is to have my images reach the widest possible audience, I believe an audio slideshow contribute to that in many ways. I have several more videos currently in production, including ones with a narrative as well as more audio from locations. You can follow the process on my blog.